The Directorate of the Cave of the Patriarchs announced Thursday that Yitzchak Hall will be closed off to Jews throughout Yom Kippur, and that Jews will only be allowed in on Yom Kippur Eve – the day before Yom Kippur – from about 5:30 p.m. to the end of the service. The reason for the limitations is the Muslim “Feast of the Sacrifice” that will be marked on the same day as Yom Kippur this year. On Yom Kippur, the Yitzchak Hall will be closed off to Jews, and the Cave area will be open according to the usual pattern. On Sunday, no Jews will be allowed into the Cave of the Patriarchs, also known as the Cave of Machpela, because of the Muslim holiday. Jews would most likely not have been allowed into the Cave on Yom Kippur Eve, either, were it not for Jewish Home Minister Uri Ariel, who intervened in the matter. “I was shocked to hear that the central part of the Cave of the Patriarchs will remain closed on Yom Kippur, and I congratulate the Minister of Defense on finding the formula that will allow Jewish worshipers to say at least some of the prayers in the Yitzchak Hall as well,” he said. “The Cave of the Patriarchs is the cradle of the Jewish people’s existence,” said Ariel. “Buried inside it are the Patriarchs and Matriarchs of the nation, and in our generation, we are fortunate to see it being filled again with tens of thousands of Jews who come to pray there,” added Minister Ariel. Hevron Jewish community spokesman Noam Arnon told Arutz Sheva that “after a lot of pressure was applied, it was decided that on Yom Kippur Eve, the entire Cave will be open to Jews, but not on Yom Kippur itself, which is a very significant problem. “We are very sorry that a proper way was not found to respect the sanctity of Yom Kippur. 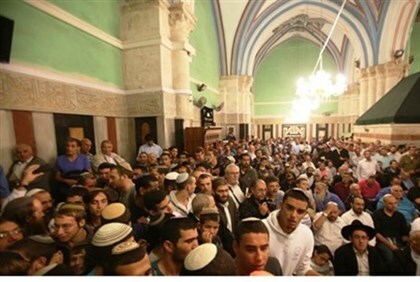 The number of Jews at the Tomb of the Patriarchs is several times larger than the number of Muslims; thousands of Jews who will come to the Cave of the Patriarchs will face crowded conditions and significant difficulties,” Arnon added.